I love Strega Nona! Baba Yaga...you should video that! I remember reading Baba Yaga as a kid! Hard to beat the Russians for wicked witch tales. Mona: She's one of my favourite characters! Gotta practice my Italian accent, bring in some dry pasta and a big pasta pot. Anything else I should bring? After that I'll read, "Strega Nona Meets Her Match"! Diana: Thanks, I will! I love this part of teaching! HA! While I'm on a leave I can have the fun and then walk out without the report card pressure! I think you meant iron teeth, not iron feet. 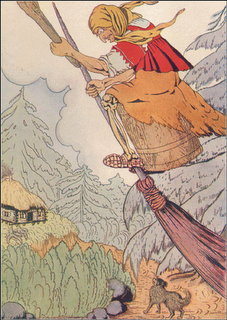 While often ascribed to the Russians, it is a Slavic tale. I remember it growing up (my parents are from Poland). It was one of the stories my daughter loved when she was younger. That sounds like jolly good fun! Baba Yaga is featured in one of those anime movies that i love. I can't remember which movie though. MOI, what an awesome thing to do! I love reading to kids and there is a local English library here that was asking for volunteer readers for story times. I think I might just do it. I love when kids stare at you with their mouths open engrossed in the story you're telling. Thanks for keeping the spirit of Halloween alive. In Florida, they've changed the day to "Change of Seasons Day" and costumes and treats are banned. How PC can a state be anyway. Seems like my Second Grade teacher did have Iron Legs and Green Rubbery hands... I would not doubt for a minute that she lived in a house that stood on Chicken Legs; none of my class mates ever went missing... you are so much fun, Ma! That apron sounds like a real treasure. I love crashing costume parties like I did this weekend where not one single person knows it's me! Richard: You are right, it's iron teeth glinting in the sun! Might it have come to Russia via Poland? I love it because she is differently dressed than "Our" typical witch. Meno: It is so much fun! I missed my calling...should have taken drama! Maggie: How perfect for you! Go for it...it's very rewarding. For me, it is extra cool because I taught all these little guys music and drama last year in Gr. 2 so they know what a nutbar I am! Stephen: How awful! What a loss for the kids! I have such great kid memories of hallowe'en! My dad used to dress up too and go out with us. Steve: Yes, that's half the fun....collecting neat junk around my house and attic to put in the pockets! Colleen: Now that is really cool! You gotta love it when people have spirit. It's that kind of thing that really makes it for me. This gave me a real good laugh - a very nice story! You know, Halloween is not a very common celebration in Norway, but we do have witches: My parents always told me they came from Bloksberg in Germany though. Great to read about the Russian folktale then! I was very entranced by her hut on chicken legs. Some versions have her flying about in the sky in a mortar, but that was not part of my tradition. I discovered Strega Nona last year and red a number of them to my daughter. Other stories she has really liked are Thumbelina, The Twelve Dancing Princesses and most recently The Princess Mouse a wonderful Finnish fairy tale. Renny: Thanks. Glad you got a laugh out of it! So did the kids! Me too! No trick or treats? Those poor kids! Richard: The chicken feet are col and the picture of her tub (in which she rows across the water that was made from the mirror the cat gave her) is on chicken feet too. There are many different versions I have found. This one didn't fly at all. Another version had the child embroidering in a room instead of washing in a tub. I'll have to ask my Finnish friend whether she knows The Princess Mouse. I'll check the story links later. Thanks. Always neat to get directed to a new book! What a great story, I have always loved that one. What a treat for the kids! Sounds like wonderful fun! Thanks for stopping by my blog and commenting. You are welcome back anytime. Brooksba: It is a treat for both of us! I'm doing Strega in a few weeks. Annelisa: Thanks! I would have loved a student like you in my class! I wish my teachers had been like many teachers today. I would have flourished. Educators like you aren't made; they're born. How lucky we all are that you choose to share your gift with the next generation in this way.